We weren’t quite aware that Etsy had become the black market of the Internet… so much so that the online shopping site had to update its policy guidelines to prohibit a slew of items formerly available on its marketplace. Last week, Etsy made an announcement via its blog that it will be limiting the types of “offbeat and fascinating” items users can attempt to sell, including human body parts and drug paraphernalia. In effect as of August 8th, users will no longer be able to buy or sell hazardous objects, from smokable products like tobacco alternatives to flammable items such as sparklers and matches. Tobacco-related accessories such as water pipes, bubblers, oil domes, hash skillets, vaporizers, and ash catchers have all also been added to the prohibited items list. Incenses are still fine by Etsy. What’s even odder in this “Don’t” list is the limit of selling human organs and remains, including “skulls, bones, articulated skeletons, bodily fluids, preserved tissues or organs, and other similar products.” Teeth and hair, however, are perfectly okay even though those are still pretty weird things to buy online. 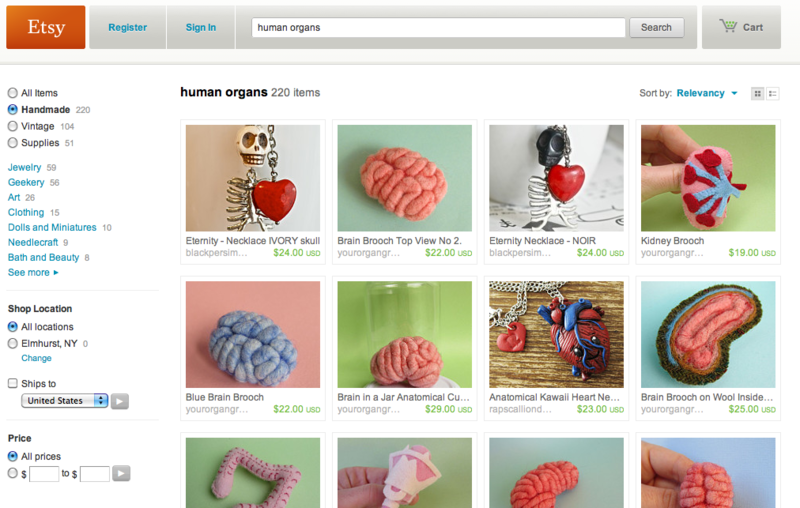 Still, we have to wonder: Who exactly was looking to Etsy for second-hand kidneys? We can sort of understand buying crochet spleens or maybe even a colon plush for the sake of teaching your kids anatomy, but the real deal is just much too creepy. Shop owners who have been affected by this update will be notified by Etsy directly. The site will ask that the sellers either take down the now-prohibited item or update the listing to make the product compliant with new rules, such as selling tobacco pipes without carburetors. Shoppers who come across stores selling questionable items are also asked to report the listing to Etsy to help the site extensively review its marketplace products.